Here is a cute rundown of Adie's Christmas list, I really love the idea behind "something you want, something you need, something to wear & something to read" as a guideline for gifts. 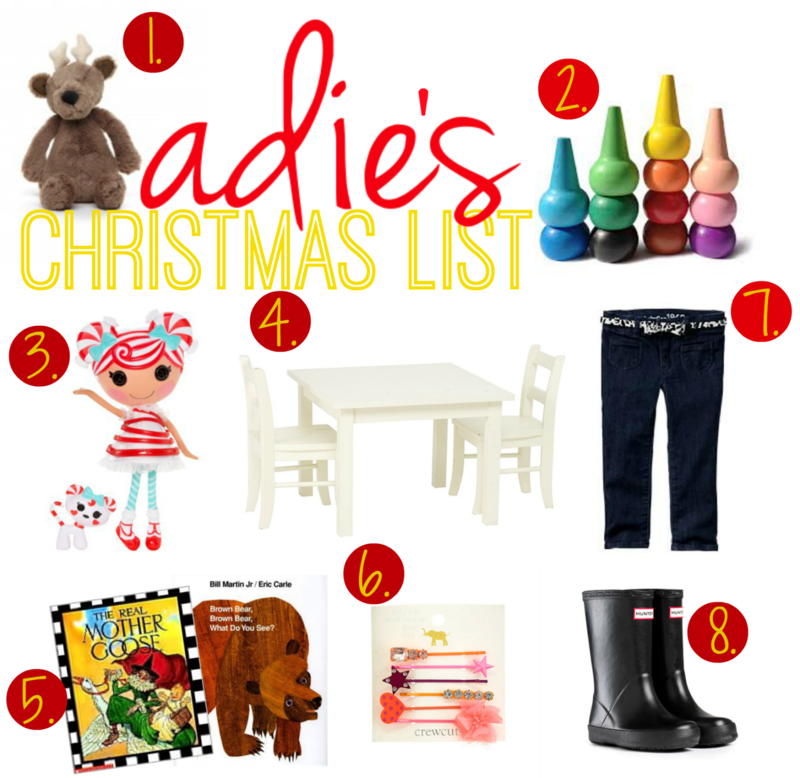 Also, I would get her anything off of our wish lists you can see here! I think she is going to have a very Merry Christmas! Adie isn't a huge fan of "toys." We've discussed getting her a play kitchen, (you know the pink one from PBK) but ultimately decided it might be a better birthday present. She prefers toys that she can pack up into her suitcase or shopping cart and wheel around with her. She loves books, stuffed animals and of course, doing all things that mama is doing! Today I got Adie her little personal chair and I almost burst out in tears, I cannot wait! I am so excited to see her sweet little face and how she will just light up when she sees it! I also got her Christmas Eve pajamas and slippers! SO CUTE!